David Allard "has chickens" and asked us for some of the chaff that comes off the coffee beans during roasting. He wanted to try it out as "deep-bedding" for his chickens. We love this use for something we otherwise throw away. He came by today for a thirty gallon bag full. 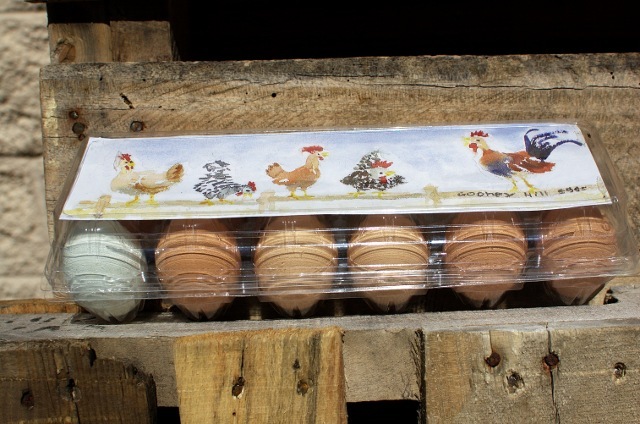 And as a thank you gift he presented Andrew and I with these eggs from his hens at Gooney Hill. If you need some chaff let us know. No gift required. Buy 8 pounds or more and we pay your ground shipping.